At the beginning of the year you set a goal to work out at the gym three times a week. The first few weeks you bounce out of bed and head to the gym. Woo-hoo! By the middle of January you’re hitting the snooze button more often than not, and the bounce has become more of a crawl. March rolls around, and you’re spending lots of time thinking about working out. And by April your workout consists of beating yourself up for being a total failure, wondering what the heck is wrong with you and what’s up with not being disciplined and motivated enough to work on a goal that’s really important to you? You don’t have to be a wildly creative thinker to conjure up a “start strong – flame out” experience. We’ve all lived some version of it. I’m SO irritated with myself. I set all these goals in January, goals that are really important to me, here it is April and they’re all a total bust. This happens to me every year and I swore this year would be different. I hate feeling like I’m the kind of person who can’t get my ^%$* together, but I’m starting to wonder if that’s exactly who I am. Despite her feeling that she’s just not up to snuff, that’s not the problem. The real issue is that she’s caught in the all or nothing trap. What’s the all or nothing trap? It’s the belief that everything is either going well OR everything is a total bust. There’s no middle ground. The truth is everyone runs into obstacles while working towards a goal. It’s just part of the journey. But when you get caught in the all or nothing trap, danger lurks. Unless you find a way to release yourself from the trap’s clutches, odds are your inner critic will convince you you’ll never achieve your goal. Fortunately there’s a way to escape! Try these practices to gently and compassionately get yourself back on track with your goals. Clear your head. Be still – or get your body in motion – whichever works best for you. 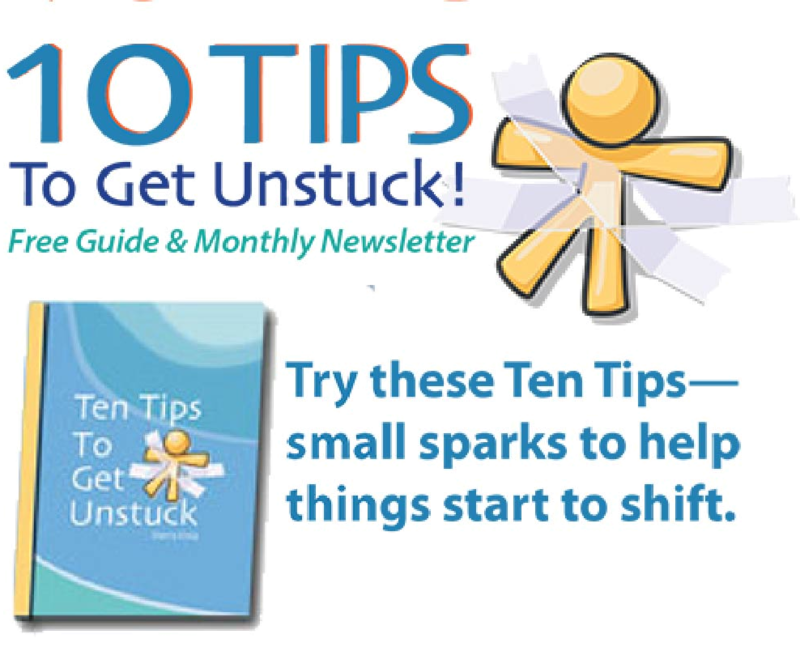 Stuck often throws our minds spinning into an endless loop of, “I’m stuck, I don’t know what to do, I’m stuck, I don’t know what to do, I’m stuck ….” And that head noise shuts down your problem-solving skills and intuition. Physical stillness or motion are the antidotes. Stop beating yourself up. Yes, I know, it’s not always easy. But self-flagellation never helps. Make the choice to be kind to yourself as you move forward. What makes your goal compelling? Be sure you’re clear about your goals and that you truly care about what you’re trying to accomplish. Otherwise, it’s virtually impossible to stick with it when you run into tough spots. Get curious about the stuckness. Look back to where you got stuck and notice what was going on there. How were you making progress? What came up to block that progress? And what’s the useful information there? Practice curiosity at the level of a four-year old who finds everything in the world endlessly interesting … it’s amazingly powerful and freeing. Throw your purse (or wallet) over the wall. When you throw something valuable over the wall, you’re motivated to retrieve it :-). When I was developing my first workshop I dragged my feet so long it was a miracle I had soles left on any of my shoes. I finally decided the only way to light a fire under myself was to announce the date. It worked. What can you throw over the wall to get your goal moving again? Shrink your steps. Stuck often happens when you’re trying to do too much too fast. That tiny step is often all it takes to regain momentum. Celebrate progress. Milestones, itsy-bitsy steps, learning, forward momentum, and getting back on track … all worthy of celebration. Achieving your goals is never all or nothing … there’s always something to learn and a way to move forward. With eight months and six days left in the year, there’s still plenty of time to achieve your 2013 goals!